As on Friday 17 November the conditions were: fine and Dead5, rail out 3 metres. Showers forecast Saturday afternoon. 1.05 p.m. R2 4 On the Rocks (3 c Alamosa – Cold Shoulder, by Volksraad) – Jake Bayliss; has been scratched a couple of times because of wide draws and cops a reasonable barrier (7) in the $10,000 Maiden 1600 metres. He followed his debut fifth over 1200 metres to subsequent winner Descendant (O’Reilly) at Te Rapa, with an improved effort for fifth (good last 600m: 34.5) to highly regarded One Prize One Goal (Ekraar) at Te Aroha. 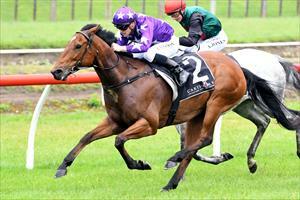 After a 1200m and 1400m, respectively, he rates an each way chance stepping to a mile in this field. 2.15 p.m. R4 6 Resurrect (5 g Shinko King – Errant, by Jungle Pocket) – Jake Bayliss; presented in good order before winning the Rating 75 1300 metres here a fortnight ago, carrying 59kgs on rain-affected Dead6 footing. Up in grade but down in weight (55.5kgs) in the $30,000 Rating 85 1200 metres, he faces a stiffer assignment but a winner of three from 13 starts that continues to improve. Fixed odds: $6.00 & $2.00. 2.48 p.m. R6 14 Makarios (5 g Makfi – Silken Power, by Woodman) – Mark Du Plessis; raced well for third here a fortnight ago in the Rating 65 1400 metres, with Du Plessis aboard, and steps up in grade from barrier three in the $25,000 Rating 75 1600 metres. With two thirds this time in, he arrives in good form but faces a stronger field. Fixed odds: $16.00 & $4.50.